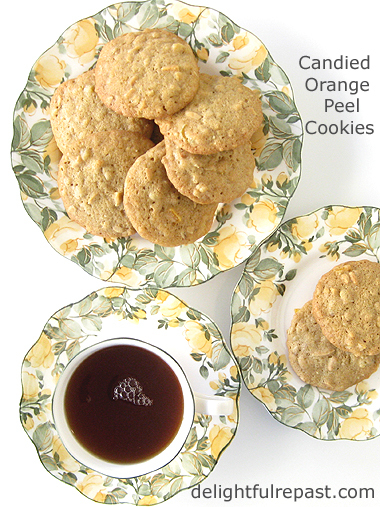 Candied Orange Peel Cookies is my take on a recipe I found on the lovely tea blog Bernideen's Tea Time, Cottage and Garden. 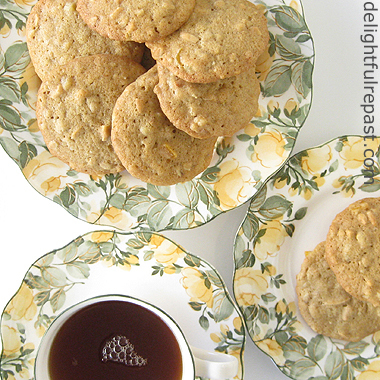 I went there one Friday to share my Candied Orange Peel and there was her recipe for Orange Slice Candy Cookies. I had no orange slice candy, but since I had my stash of Candied Orange Peel on hand, I naturally thought it would be perfect for Bernideen's cookies. And, naturally, I made a few other substitutions. Her recipe called for three eggs and I only had two (and I was not going to run out to the store! ), so I doubled the fat (butter, as I had no shortening) to make up for the missing egg. That's the sort of reasoning that makes perfect sense here at Butter World anyway! Since I use extra thick organic rolled oats, I thought I better give the dough at least an hour in the refrigerator to give the oats time to absorb some of the moisture before baking. I didn't add as much water to the dough as Bernideen did because I used butter rather than shortening, and butter has quite a lot of water in it. My cookies came out darker, flatter and crispier (crun-chewier) than Bernideen's. That wasn't my intention. I was aiming for Bernideen's beautiful soft cookie. But I baked them a few minutes longer than she did (I'm easily distracted!). Also, butter makes a crispier cookie, while shortening makes a softer cookie. And then there's that third egg I did not have. But, either way, I don't think you can go wrong. Bernideen and I have both made a fair amount of cookies to go with our tea! But next time I'm going to try that third egg! 1 In small bowl, whisk together flour, soda and salt. In another small bowl, stir together orange peel, toasted nuts, oats and 2 tablespoons of the flour mixture, separating any pieces of peel sticking together. 2 In large bowl of electric mixer (or large bowl and spoon), beat butter on medium speed for 30 seconds. Add sugars and beat until light and fluffy, about 5 minutes. Beat in eggs and vanilla extract. By hand, stir in flour mixture, orange peel, nuts and oats. Stir in water. Cover and refrigerate for 1 to 24 hours. 3 Preheat oven to 350F/180C/Gas4. Drop #40 scoops (0.8 ounces or approximately 1.5 tablespoons) of dough 3 inches apart onto greased or parchment-lined cookie sheets. Bake for about 12 to 15 minutes or until lightly browned and still a little soft in the center. Cool on baking sheet for 1 minute, then remove to wire racks to cool completely. this one displaying her lovely Orange Slice Candy Cookies. 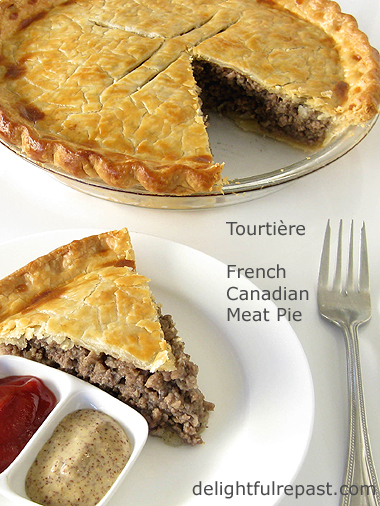 Tourtiere (pronounced something like tor-tee-ehr), or simply, Meat Pie, is a dish my husband, whose father was French Canadian, remembers from childhood. Mr Delightful hadn't had this dish since his Mémé died many years ago. I decided to make it for him this week in honor of his sister who recently died. Living far apart, we vacationed together every year and had such good times. I loved her and her sense of humor. One day on my first stay in her home we had watermelon. I was fixing some for Mr Delightful when she asked me what I was doing. When I told her that her brother only liked it this way, she rolled her eyes and said to him, "Brother, Ma would be so happy to know you married a girl who takes the seeds out of your watermelon." I don't know whether my sister-in-law ever made any foods from her childhood, but if she did they would have been foods from the French Canadian side because she and Mr Delightful did not think too highly of their mother's general cooking! Some of my sister-in-law's specialties were the Middle Eastern dishes she learned from her husband's family (here's tabbouleh). Everyone loved her stuffed grape leaves, which she always made in huge quantities. Another Middle Eastern dish she made was simply called meat rice, made with ground meat (lamb, I think) and spices, including cinnamon. So she wouldn't have hesitated to use cinnamon in her tourtiere as many people do; but I just couldn't bring myself to do it, though I did use the allspice, mace and cloves, albeit in smaller amounts than generally called for. Note: That makes waaaaay too much egg wash for one pie, so if you hate food waste like I do, plan to use it in something else the day you make this. 1 Peel potato, cut up, boil and mash (you should have 1 to 1 1/4 cup); set aside. 2 In large skillet, heat oil and saute onion until soft, about 10 minutes. Add the ground pork and ground beef and cook over medium heat, stirring to break up the meat so that it won't cook into clumps. Add in the seasonings as the meat cooks until most of the liquid is gone, about 20 minutes, Stir in the mashed potato, mixing well. Taste and adjust seasoning. Cover and refrigerate until completely cooled, about 2 hours. 3 With metal blade in place, add flour, salt and baking powder to work bowl of food processor. Turn on for three seconds to combine. Add half the frozen butter and pulse for six 1-second pulses or until the frozen butter is the size of large peas. Add remaining butter and pulse for three 1-second pulses. 5 Turn dough out onto two pieces of plastic wrap, using a little more for the bottom crust, and flatten each slightly into a 4-inch round disk. Wrap and refrigerate for 30 minutes. 6 Roll out the bottom crust (save the plastic wrap). It should be 13 inches in diameter and about 1/8 inch thick. Transfer dough to 9-inch pie plate, pressing it in place without stretching it; cover with reserved plastic wrap and refrigerate. Roll out top crust (again, save the plastic wrap) and place it on a rimless baking sheet; cover with reserved plastic wrap and refrigerate. 7 Preheat oven to 425F/220C/Gas7. Spoon the meat filling into the pastry-lined pie plate, pressing it down lightly to compress it a bit. 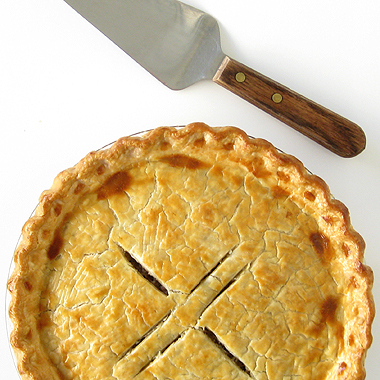 Brush the edge of the pastry with water and place the top crust, pressing the edges together to seal; trim and flute. 8 Beat the egg and water together and brush crust with the egg wash. Cut some steam vents or use a fork to make a pattern of small vent holes. Bake for 15 minutes, then reduce heat to 375F/190C/Gas5 and continue baking for 30 minutes. Let stand 10 minutes before cutting and serving. Note: After the first 15 minutes, I put a pie crust shield on it to protect the already browned crimped edge. 9 Some families have the tradition of serving tourtiere with mustard, some with ketchup; still others, gherkins or pickled beets. 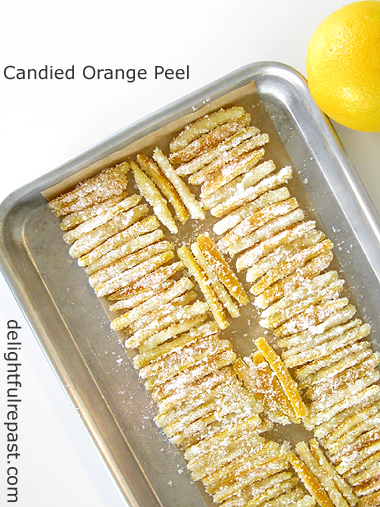 There's candied orange peel and then there's candied orange zest. This is the more substantial candied orange peel. It can be eaten like candy (with or without having been dipped in tempered dark chocolate!) or used in baking or as a garnish. 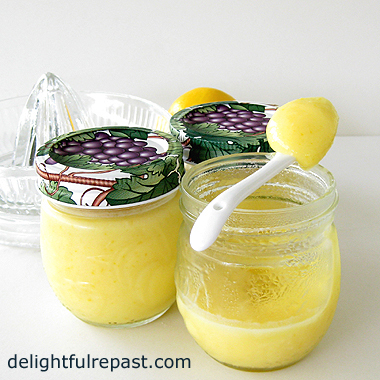 Wonderful in fruitcake or plum pudding, it's also a great addition to an orange cake, frosting or filling. It's a perfect garnish for a rice pudding or a chocolate tart, for a cocktail or a hot chocolate. 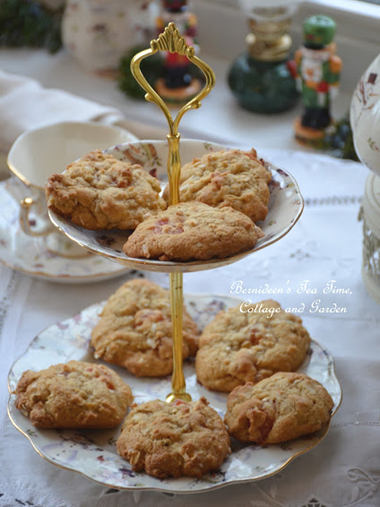 Scrumptious in scones or as a confection on the tea table. 1 To carefully remove the peel from the oranges, cut off a bit of the top and bottom of each orange, then make 4 vertical cuts and pull the 4 pieces of peel away from the orange. Cut each vertically into 1/4-inch wide strips. (And, when I'm feeling particularly persnickety, before I cut the strips I make sure that each section of peel is the same length.) You can leave the pith on or cut it away as much as you like with a sharp paring knife. If you want diced candied orange peel rather than strips, cut the strips into 1/4-inch dice. But I just make strips that can be diced later as needed. 2 Put into a 2-quart saucepan and cover with about a quart of cold water. Bring to a boil and gently simmer, loosely covered, for 15 minutes. Drain, rinse, and drain again. 3 While the peel drains in the colander, add 1 cup sugar and water to the saucepan; heat, stirring gently, to dissolve the sugar. 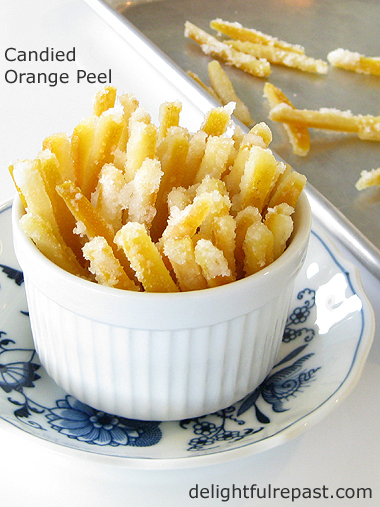 When sugar is dissolved, bring to a boil and add the well-drained orange peel. Simmer for about 45 to 60 minutes, uncovered, or until the peel becomes translucent. Do not stir; just give it a swirl once in a while, if needed. 4 Remove from heat, drain (reserve syrup for another use), and spread onto a baking sheet lined with parchment. Allow to cool slightly before dredging in remaining 1/2 cup sugar to just coat. Place back on the parchment and allow to dry at room for 1 to 2 days (I just put it inside the oven or the toaster oven to keep it out of the way and somewhat "covered"). Place in an airtight container. 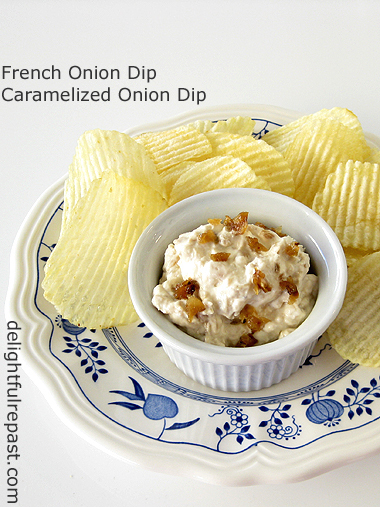 French onion dip (because it starts out just like French onion soup), or caramelized onion dip, is the fresh, and in this case organic, version of that ever-popular dip made with dry onion soup mix. I just read the dip was invented in 1954 by an anonymous person (in California, presumably, since it is called California Dip). I'm not saying that dip doesn't taste good, but, well, I don't like packaged foods. 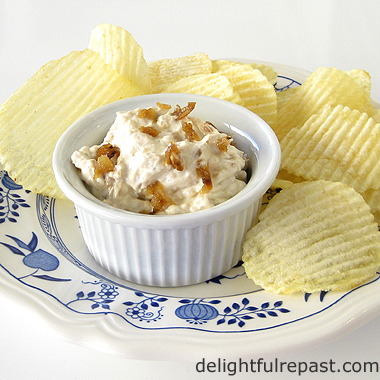 That said, I like potato chips with my onion dip. I know, I know, but I don't eat them very often. In fact, this week was the first time in a year or two I've had potato chips. If you're even better than that at keeping away from junk, you'd probably like this dip with raw vegetables. Anyway ... This is the season when many people are having parties or taking something appetizer-ish to parties, so I thought it would be a good time to post an easy recipe for that sort of thing. This takes some time to caramelize the onions, but is very little work. Just put the onions on to do their thing while you're doing other things. What's your favorite kind of dip and dipper? 1 In heavy-bottomed large skillet (I use the All-Clad Stainless 12-Inch Fry Pan), cook the onions in butter and oil over low heat, covered, for 15 minutes. No need to watch them, just set the timer and walk away. 2 Stir in the Worcestershire sauce, sugar (helps with browning) and seasonings. Cook, uncovered, over moderate heat (onions should be sizzling), stirring frequently,* for about 45 minutes or more, or until onions are well caramelized, evenly brown. * As I said in my French Onion Soup post, Who even knows what "stirring frequently" means? I've never seen a definitive answer to that question, so I'm going to say it means every 2 or 3 minutes (though maybe every minute toward the end). And you'll notice a few more helpful hints in my updated French Onion Soup post. 3 Cool completely. Put cooled onions in work bowl of food processor and pulse until finely chopped but not pureed. Every food processor is different, but I found 18 pulses to be just about right. In a 1-quart bowl, stir together onions, sour cream and mayonnaise. Taste and adjust seasoning. Refrigerate for up to 4 days. 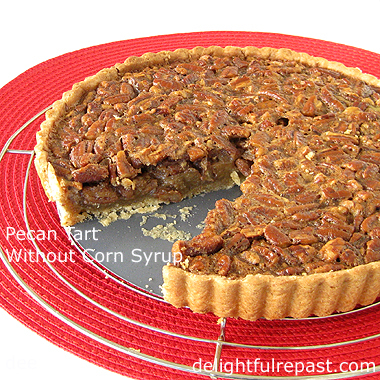 Pecan tart is, to me, the quintessential autumn tart. Usually made with corn syrup, which I refuse to eat, my version is made with brown sugar and real maple syrup. I'm not going to tell you this is a low-sugar dessert, just that my version has less sugar than most. But still, you only have a sliver, right? And the sugar is "offset" a bit by a healthy amount of positively proteinaceous (is that a word?) pecans. 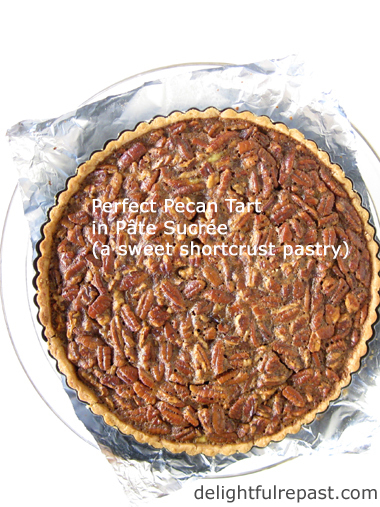 If you prefer the heftier (deeper) portions you get with a pie, or you don't have a tart tin, try my Pecan Pie - Without Corn Syrup. But if you don't have a tart tin this size, I urge you to get one so you can make this as well as Bakewell Tart, Lemon Tart, Chocolate Tart, Custard Tart, Eggnog Tart and Savory Summer Tart. The first time I made the pastry with Bob's Red Mill Gluten Free 1 to 1 Baking Flour, I used my usual sweet shortcrust pastry recipe below, just using the 1 to 1 in place of the unbleached all-purpose flour. The gluten-free pastry was delicious, but a bit delicate. So the next time I made it, I added 1/4 teaspoon xanthan gum to the Bob's Red Mill 1 to 1. And gluten-free blends usually need a bit more water than regular flour. 1 Add flour (or gluten-free blend and xanthan gum), powdered sugar and salt to work bowl of food processor; turn on for about 3 or 4 seconds to combine. Add chunks of butter; pulse to a crumb texture. Add egg yolk and water*; pulse until the dough starts clumping together. This is to be a crisp, more cookie-like crust, rather than a flaky pastry; so there's not quite the concern about over-processing. Flatten slightly into a 4- to 6-inch round disc, wrap and refrigerate for 30 to 60 minutes. * Gluten-free blends take more water than unbleached all-purpose flour does. So start with 4 teaspoons. If it's still dry, add a little more, 1 teaspoon at a time. 2 Set a 9-inch/23cm tart tin (1-inch deep) on a baking sheet. On lightly floured 12-inch square of aluminum foil, roll out the pastry to a 12-inch circle. Transfer dough to tart tin, pressing dough (but not stretching it) to fit the tin. (Save the foil; you're not done with it.) With scissors or knife, trim the overhang to 1/2 inch all around. Fold it in and press it to the sides to form a thicker side crust. Trim the edges* by rolling the rolling pin over the top. Press the pastry into the flutes so that it rises a bit above the edge (in case of shrinkage). Pop it in the freezer for 15 minutes while you preheat the oven to 375F/190C/Gas5. * Don't throw away the scraps; they make wonderful cookies (maybe 2 or 3 of them). Just press them out and throw them on the baking sheet next to the tart tin. 3 Give the "used" side of the reserved piece of foil a shot of cooking spray and place it over the chilled pastry, pressing it to fit well. Spread 2 cups of ceramic pie weights (that's two packages of Mrs. Anderson's ceramic pie weights), also called ceramic baking beans in the UK, over the foil. Bake for 15 minutes. Remove foil and weights; continue baking for 10 minutes, until lightly browned to a pale golden. Let stand 30 minutes to cool. 4 While pastry is cooling, preheat the oven to 350F/180C/Gas4 and make the filling. 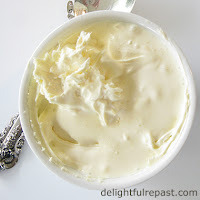 In 1- to 1.5-quart bowl (I use a 4-cup glass measure), melt butter in microwave. Add brown sugar and salt to warm melted butter; mix well, mashing out any lumps of sugar. Stir in maple syrup. Add hot brewed coffee or boiling water, stirring until sugar is dissolved. Add eggs and vanilla; mix well, until mixture is very smooth. Stir in pecans. 5 Pour filling into prebaked pastry shell. Bake (with tart tin on baking sheet) for about 30 minutes, until slightly puffy and a deep golden brown. The center should feel set yet soft when pressed lightly. If you have an instant-read thermometer and want to get really precise, the target "pull" temperature for pecan pie filling is 200F/93C, though it might be less for mine, perhaps 195F/90C, because I use a lot less sugar than most. 6 Cool on wire rack at room temperature for at least 3 hours. If you make it a day or two ahead, refrigerate it until 2 hours before serving time; allow it to come to room temperature. Or warm at 275F/135C/Gas1 for 15 minutes before serving. Cut into 8 to 12 wedges and serve with a dollop of unsweetened or barely sweetened whipped cream. Disclosure: Some posts contain links to my affiliate account at Amazon. If you purchase something from Amazon through one of my links, I receive a small commission, at no additional cost to you, which I use toward the expenses of running this blog. Thanks for supporting Delightful Repast when you shop at Amazon! Great gift idea! A 3-tier stand is a stylish way to serve hors d'oeuvres at your next party, though of course it is tailor-made for afternoon tea. 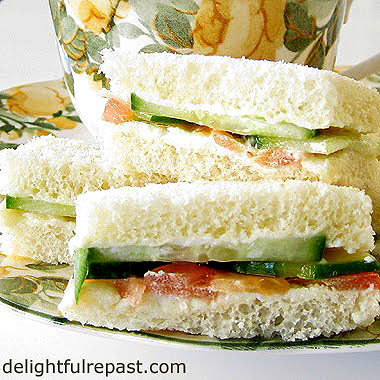 Afternoon tea, the classic British-style afternoon tea, is something I enjoy as often as I can, at home or at a friend's home, at a posh hotel or a cozy tearoom. My first posh hotel afternoon tea was at the Empress, now the Fairmont Empress, in Victoria, British Columbia, Canada. It was only fitting, since I had heard so much about it from my mother and grandmother who had emigrated from England to Victoria (then eventually to the US). And, of course, we had tea at home. Tea has been my beverage of choice since the age of two. 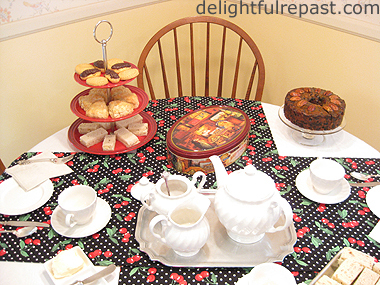 I give afternoon teas for my friends and have "converted" many to tea over the years. I've had smaller and larger teas, but most often have four to six people, sometimes indoors and sometimes in the garden in the gazebo. I make two or three different tea sandwiches; scones with clotted cream, lemon curd and raspberry or strawberry jam; shortbread and other sweets. The good thing is, nearly all the work is done in advance, so you have time for a bit of a lie-down before putting on your tea frock and greeting your guests. And, if you are new to giving afternoon teas, do keep it simple the first few times. Here’s all you need to know! 1 The three courses, the three S's of tea—sandwiches, scones, and sweets—can be extravagant or simple. Indoors, I usually have guests serve themselves at the tea table and sit round the living room. Outdoors, we sit at the table in the gazebo and have a sideboard for the things that won’t fit on the table. 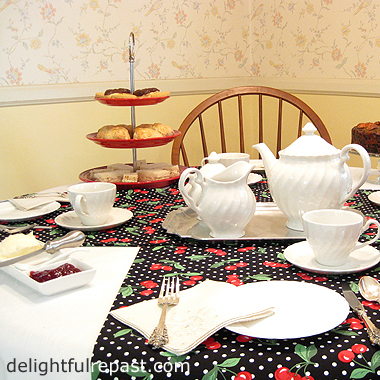 The afternoon tea pictured here was what I call a Table Tea in the corner of my kitchen. 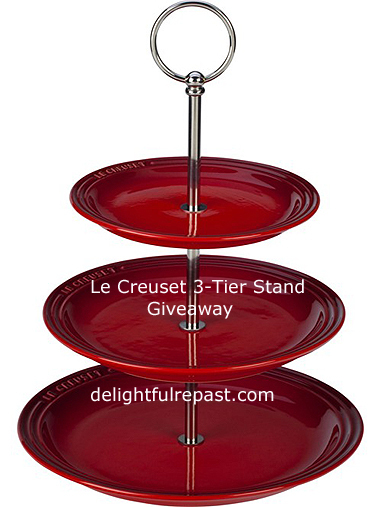 Did you notice that beautiful red Le Creuset 3-Tier Stand (available in 8 colors)? A 3-tier stand is just the thing for afternoon tea. Sandwiches on the bottom, scones in the middle and sweets on top makes sense to me because I like to eat more sandwiches and fewer sweets. 2 Invite your guests to dress for the occasion. It will add to the ambience. For the ladies, this means dresses, gloves (removed before eating, of course) and even hats, if they have them. For the gentlemen, the male equivalent (though I usually don't ask anything more than long trousers and polo shirts of the men!). My friends and I always create somewhat of a sensation when we go out to tea in our tea attire. We like to think we bring up the tone of the place! 4 To make a proper pot of black tea, just before a kettle of freshly drawn water comes to the boil, warm the teapot with hot water, empty it, add one teaspoon of tea leaves for each 8 ounces of water. Immediately pour in the freshly boiling water, let it stand for 5 minutes, stir, and then strain into cups. If you prefer to use a tea ball, be sure it is large enough to allow the tea leaves to unfurl. 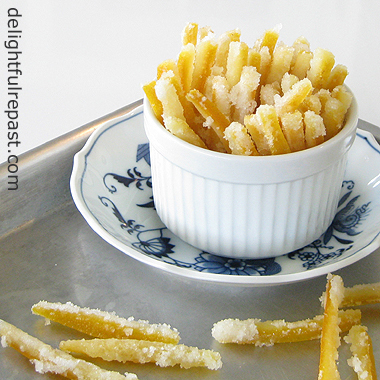 Serve with sugar or sugar cubes, thin slices (not wedges) of lemon and a small pitcher of milk (never cream). You'll want to experiment with tea amounts and steeping times, shorter or longer by a minute or two, with each new tea you try to get just the brew you like. 5 Make one to three kinds of tiny, crustless sandwiches (six to eight total per person), and cover them properly* before refrigerating for a couple of hours until serving time. You might also include savory tartlets, mini quiches or mini meat pies. * You'll see the method in the directions for my tea sandwich recipes. Since this tea was just a "simple" Table Tea in my kitchen, I made just two kinds of sandwiches: Almond Chicken and Egg and Dill Tea Sandwiches. 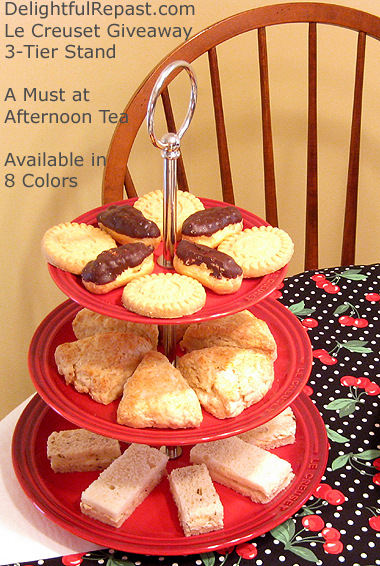 6 Scones, another afternoon tea essential, can also be made ahead; just reheat at the last moment. Homemade are vastly superior to store-bought and so easy to make. 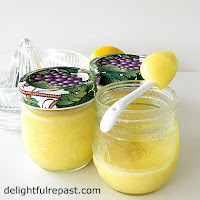 Serve with raspberry or strawberry jam, lemon curd and clotted cream. I nearly always cut my scones into wedges because that's the shape my mother and grandmother made. And if you read the recipe, you'll find another good reason. 7 Make or buy a selection of dainty sweet treats, perhaps three of the following: shortbread or other biscuits (cookies), miniature cream puffs, mini muffins, petits fours and pecan tartlets. In addition to my homemade fruitcake, I served Walker's Shortbread and mini eclairs that I bought for the occasion. This giveaway is open to US residents* 18 years of age or older. Leave a comment below (one entry per person) that includes what you want to serve on the 3-tier stand. Please include your email address in the body of your comment. Must enter by 11:59 p.m. Eastern time Wednesday November 30. *If you are outside the US but would like to have this sent to someone in the US (you would have to send them a gift card separately on your own), go ahead and enter! Winner will be chosen by random drawing and be announced here in the comments before noon Eastern time on Thursday December 1. If I don't hear back from the winner of the random drawing by noon Eastern time Sunday December 4, another drawing will be held and a new winner selected from the original entrants (those who commented before the giveaway deadline). 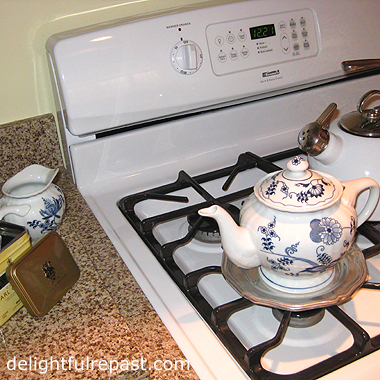 Disclosure: Le Creuset provided a 3-tier stand for review purposes and one for the giveaway. I received no compensation. The views expressed here are entirely my own. I always tell my readers what I really think! Fruitcake is just called fruitcake all year round in the US, but in the UK at this time of year it's also called Christmas cake. If it's made on what is called Stir-Up Sunday (20 November this year), as some have the tradition, it has just over a month to mature (or ripen) before the holiday. I'm posting my recipe now for those who observe that tradition, but I love fruitcake year round and am as likely to make it at the height of summer as now. And when I say fruitcake, I mean proper fruitcake, not those horrible shop-bought things that double as doorstops, filled with cheap sugary "fruits" that glow in the dark! 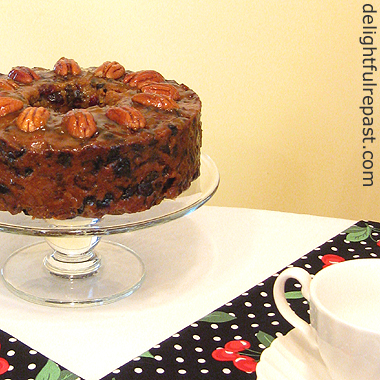 If you think you don't like fruitcake, you've probably never had a good one! 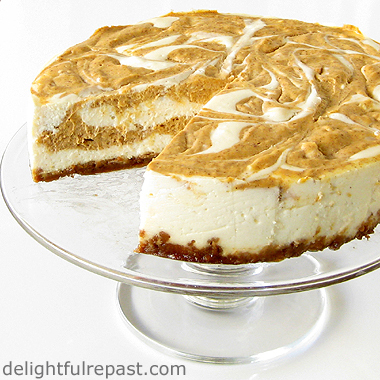 I go easy on the spices -- it's not a spice cake, after all -- and use a combination of organic dried fruits and nuts. It's quite a process (but not a lot of work really) -- soaking the fruits, making the cake, feeding it each week and then icing the cake in marzipan and royal icing; but I skip that last step. If I want to get fancy, I'll brush on some warm apricot jam and arrange sliced almonds or pecan halves over the top. 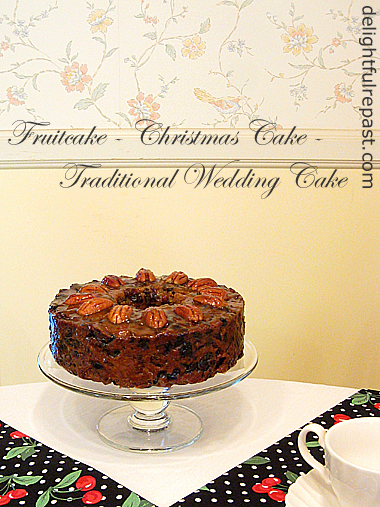 It's a bit late now, but I can't think why I didn't have fruitcake as the top tier of our wedding cake. It was once the traditional wedding cake in the UK and a tradition I would have happily carried on. 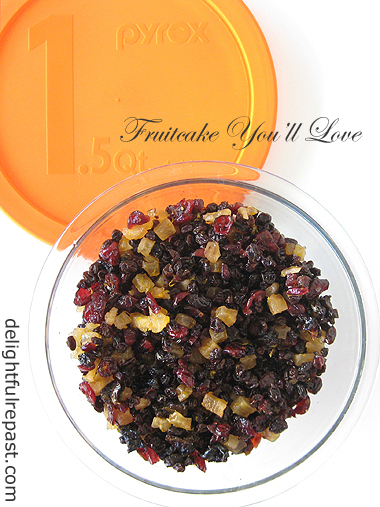 Since fruitcake is so rich, it is cut into quite small pieces. And you may have noticed how difficult it can be to handle very thin wedges of cake. I've found the easiest way to serve the cake is to cut a 2-inch circle out of the middle and then cut 28 (about 28) 3/4-inch-thick (2 cm) slices from the ring. I used the Ateco Stainless Steel 2x3-Inch Round Form to cut the 2-inch circle, then later thought, why not just put it in the middle of my pan and hold it steady as I put in the batter? You could turn any pan into a ring mould! How about you? 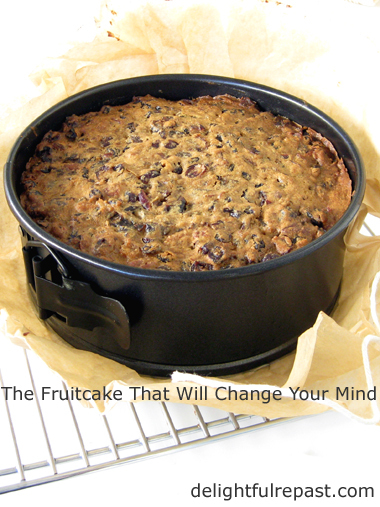 Are you a fruitcake fan? If not, I bet you would be if you made this one! Other winter traditions you might want to try: Eggnog and Mince Pies. 1 About 12 to 24 hours before mixing cake, stir together fruit, zest, juice and brandy in a 1.5-quart bowl. Cover tightly and let stand for about 12 to 24 hours. 2 Prepare baking tin. Butter the inside of 7-inch/18cm springform pan (about 2.75 inches/7cm deep). Line the bottom with a circle of parchment paper; butter the parchment. Set the tin on a quarter sheet pan for baking. Note: By way of experimenting, I also in one case wrapped the tin in a double layer of parchment that extends above the tin and tied it with string. The idea is to prevent over-cooking during the long bake, but I don't think it was necessary. Another idea I tried with one cake was to put a pan of hot water in the oven with the cake. Again, I don't know that it is at all necessary. I think putting the springform pan on a heavy-duty quarter sheet pan for baking is all you need to do. 3 Preheat oven to 275F/135C/Gas1. In 1-quart bowl, whisk together flour, almond flour, ground spices and salt. Stir in chopped nuts. 4 In bowl of stand mixer or in a 2-quart bowl with electric mixer or big spoon, cream together softened butter and brown sugar until light and fluffy, about 3 minutes. Add vanilla extract and eggs, one at a time; mix well. 5 By hand, stir in flour mixture, followed by the soaked fruits. This recipe makes about 5 cups of batter. Scrape batter into prepared baking tin, pack it in firmly and smooth the top. 6 Bake on the baking sheet for 2 1/2 hours, then test. If toothpick inserted in center does not come out clean, check it every 10 minutes. I aim for 200 to 210F/93 to 99C on instant-read thermometer. 7 When it is done, take the tin from the baking sheet and place it on a wire rack to cool for 20 minutes. Remove cake from the tin and continue cooling until it is completely cool. The cake is 2 inches high and weighs about 2 pounds 14 ounces (2.875 pounds/1.3 kg). 8 When completely cool, use a toothpick or fine skewer to prick holes all over the top of the cake about an inch apart. Sprinkle 1 1/2 tablespoons of brandy evenly over the top of the cake. Wrap in parchment and foil; store at room temperature in tightly covered container. Take out and "feed" or "doctor" with 1 tablespoon of brandy once a week. Keep for at least 4 weeks before using to allow the flavour to develop. Making the turkey gravy ahead of time is something I've been doing for decades. Once you try it, you'll never go back to doing the last-minute rush ever again. You know what I'm talking about. The potatoes are mashed at the last minute, the dinner rolls are heated at the last minute, so many things to see to. By the time you sit down at the table, you're red-faced, frizzy-haired, overheated and generally just done for! I would suggest setting aside a day to do this right away. Get it done well in advance. You'll have enough broth for stuffing/dressing as well as gravy. Just freeze both until a day or two before you need them. If you make it just three days ahead, just refrigerate it. Though it's made with just 2 pounds of turkey, the gravy tastes wonderful. But, if you want added flavor or want to increase the amount of gravy, when you take your turkey out of the pan on the big day, combine the pan drippings (minus the fat) and make-ahead gravy for added oomph. On the matter of broth: I'm a huge fan of store-bought organic free-range low-sodium chicken broth, but NOT for anything to do with a turkey dinner. You MUST make turkey broth, whether this way or with the neck, etc, on the day you roast the turkey. You know I don't like to be dogmatic, but chicken broth is no substitute! Do you like to make things ahead or do it all on the day? * Other parts might work, too, but I've only ever used drumsticks as they are more readily available where I shop. 1 Preheat oven to 400F/205C/Gas6. Lightly oil a heavy-duty quarter sheet pan. 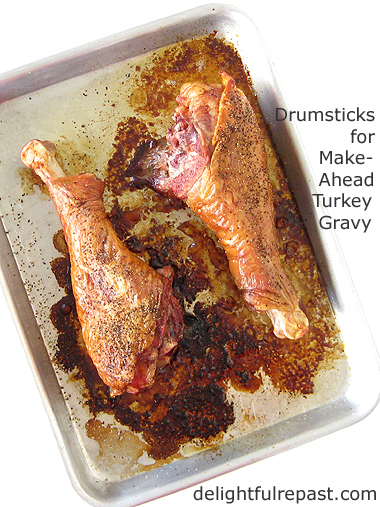 Pat the drumsticks dry and place them in the prepared pan. Sprinkle all sides with salt and pepper. Roast for 60 to 70 minutes. Sixty minutes would probably be enough, but I like to get maximum brown bits in the roasting pan. Just be sure you don't let it burn. Burned bits are not good! 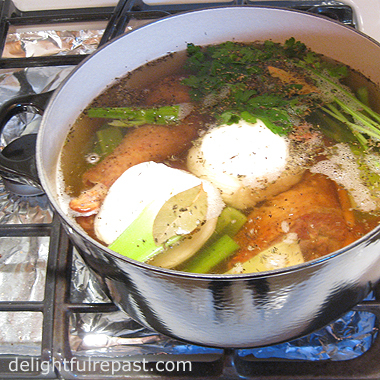 2 Transfer the drumsticks to a 5-quart pot (I use a Le Creuset 5.5-quart round French oven); set aside for the moment. 3 Place the roasting pan on the stove and pour in the liquid a little at a time, stirring and scraping up the browned bits. When pan is completely deglazed, pour the liquid into a jar, bowl or 1-cup glass measure; refrigerate. You'll see from the photo that I ended up with about 1/4 cup of fat, which is perfect! 4 Add vegetables and seasonings to the pot, along with water. Bring to a boil, reduce heat and simmer with lid slightly ajar for 4 hours, checking liquid level after second and third hours and adding more water only if needed. 5 Strain the broth into a 2-quart glass measure. You will have 6 to 8 cups of broth. 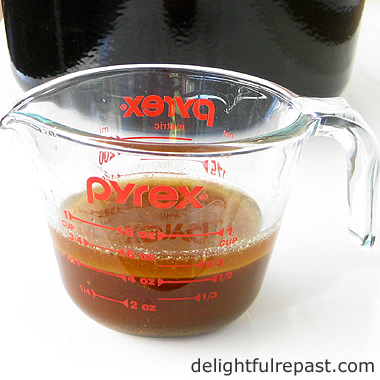 6 Transfer your refrigerated pan drippings to a 2-quart saucepan and begin heating. Add flour to pan drippings and cook, whisking or stirring constantly, for 2 minutes. 7 Add about 1/2 cup of the stock and whisk briskly until very smooth, then add remaining broth. Bring to a boil, whisking frequently, until the gravy thickens, 5 to 10 minutes. Taste and adjust seasoning. 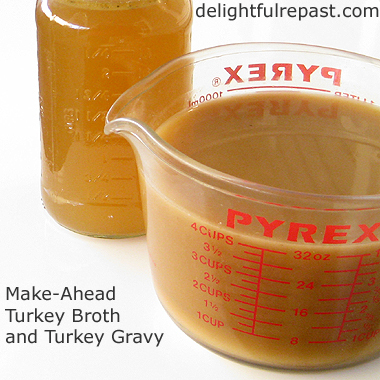 8 Leave the gravy as is or strain into a 4-cup glass measure. Pour it into a 6-cup glass freezer container. Let cool a bit at room temperature, refrigerate until cold, then freeze until the day before you want to serve it. 9 The day before you want to use it, transfer the gravy from freezer to refrigerator. Reheat the thawed gravy. What does this photo have to do with Grow Your Blog Traffic? Absolutely nothing! 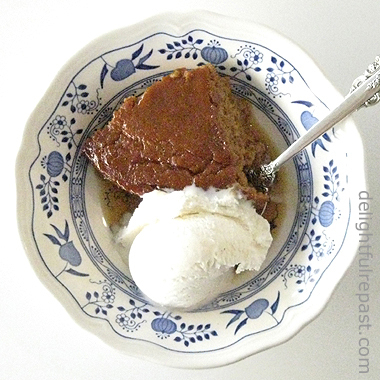 But this is a food blog and the time of year to be pointing you to my Indian Pudding - Pilgrim Comfort Food post in case you're looking for a change of pace for your autumn celebrations. I just read that people share more than 27,000,000 pieces of content every day. So I can understand why so many bloggers are trying to learn how to get more eyes on their blogs. 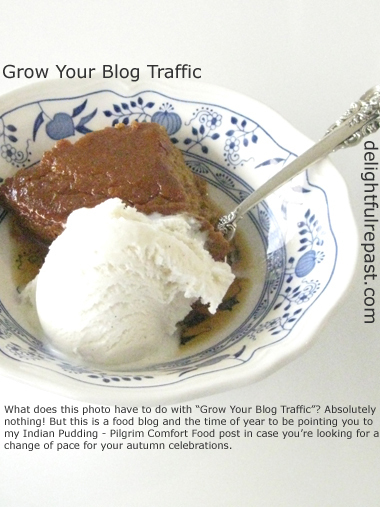 "Grow Your Blog Traffic" bloggers make up a huge niche in the blogosphere. Wonder if there are more of them than there are food bloggers? Oh, BTW, here's the link to the Indian Pudding. Would I love to be a "successful" food blogger with a huge audience? Of course! But I don't usually think about that. If I did, I'd have to pay attention to things I'd rather not. Things like posting frequency and timing, stats, SEO, email lists, paid promotions on social media platforms, what recipes are "trending." If you are a blogger who is doing all these things, please don't think I'm criticizing you. I'm just envious of your mad technical skills! Oh my. Unique pageviews versus pageviews, traffic sources, I can't even tell you all the stuff that can be tracked, should one be inclined to track them. I am not inclined. I'd be more inclined to sit and do algebra and calculus all afternoon, which might be Mr Delightful's idea of a good time, but definitely not mine. I know it means search engine optimization, but beyond that, well, it's beyond me. I just write what I write. I try to write a blog post that will inform and, sometimes, entertain my readers or a recipe that is original, appealing and clearly written so cooks at any skill level can make a success of it. I don't give a thought to such things as keywords and rankings. Whenever you visit a blog you should make a point to leave it from another page. Something about "juice." If you just visit the first page you come to, it won't help the blog's SEO; but if you click to another page of the blog before you leave, it will. So I'm trying to do this for all the bloggers I visit and, of course, would appreciate it if my visitors would do the same because, well, I need all the help I can get, right?! I keep reading about the importance of growing an email list. Can't tell you how or why because I haven't done it. Okay, I am on Twitter and, more recently, Pinterest; but I'm not on Facebook, Instagram, Yummly, Google+ or any of the other such things that seem to just keep on coming. And paid promotions on them? Uh uh. Not for me. 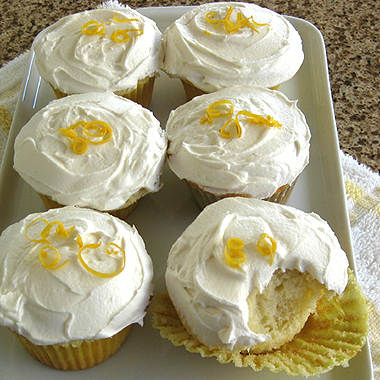 (Lemon) Cupcakes - In or Out, Trendy or Passe, Who Cares? ... and I'll go out of my way to avoid it. When I write a travel review or product review, it's of a place or thing I like and feel good about recommending to my readers; I don't care if it's "in" or "out." The conclusion of the matter, all things having been considered, is this: I'm hopeless, not high-tech, so help me out. If you are on Facebook, Google+, Pinterest, Twitter or any other social media and you like what you read here at Delightful Repast, share it. I'll try to reciprocate in some way. And please leave a comment. I'd love to hear what all my smart readers have to say about all this. If you are a blogger, what is your Number One blogging tip? Or the one thing you just can't be bothered with? Oh, and click on another page before leaving!